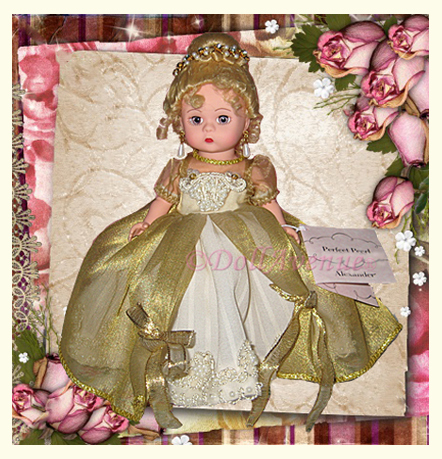 Exquisite "Perfect Pearl", is an 8" doll from Madame Alexander. She has blonde hair styled in an elegant Victorian updo with tiny tendrils framing her face, blue eyes and red lips. She has pearl dangle earrings and a lovely rhinestone and pearl hair band. The gown is simply breathtaking with a soft ecru underskirt embroidered with gold thread and pearls along the hemline and a sheer gold organza overlay open down the front of the skirt and adorned with two fabric bows. The bodice is decorated with lace and pearls. Under the dress is a layered satin and net petticoat, shimmery nylons and white satin slip-on shoes with pearls. This wonderful doll will arrive in minty condition with her hand tag and original box.